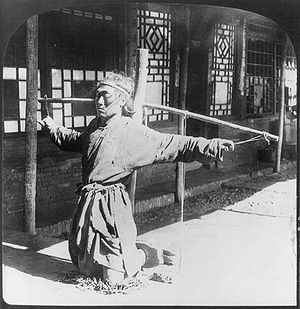 Chinese prisoner kneeling on chains (c. 1906). A crime or criminal offense is any culpable action or omission punishable by criminal law (penal law). In the legal sense, acts punishable by laws other than criminal law (e.g. civil law) are not called crimes - for example, most traffic violations or breach of contracts are not crimes in a legal sense. A person who has committed a crime is called a criminal. The systematic study of the causes (aetiology), prevention, control, and penal responses to crime is called criminology. The act of making something a crime is called criminalisation. The opposite is called decriminalisation. Colloquially, sometimes evil acts (a subjective, not a legal term) are also called "crimes" even if they are not punishable by any law. This usage may suggest that the person thinks that act should be punished. For example, an environmentalist might call the felling of a tree a "crime" although it is a perfectly legal act. This page uses content from Wikipedia. The original article was at Crime. The list of authors can be seen in the page history. As with Spanking Art, the text of Wikipedia is available under a copyleft license, the Creative Commons Attribution Sharealike license. This page was last edited on 5 September 2016, at 22:21.